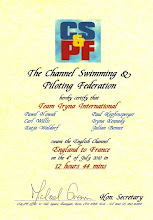 www.HoffySwims.com: British Long Distance Swimming Association - Lynn Regis Championship 2008 - The Winner Confirmed! 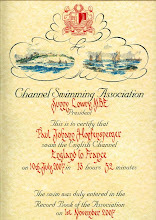 British Long Distance Swimming Association - Lynn Regis Championship 2008 - The Winner Confirmed! Above: Stephen Smith, BLDSA race organiser for the Lynn Regis Championship, presents Paul Hopfensperger with "both winners trophies" on Wednesday October 08, 2008 for the event which took place on Saturday September 20, 2008. You may remember that on September 20, 2008, I crossed the finish line of the 2008 BLDSA Lynn Regis Championship in first place, only to be denied the winners trophy for the entire event because I was too old! If not, then click here to see the original story. Well I am delighted to say, that this afternoon, the race organiser, Stephen Smith, drove all the way up from his home in Essex to present me with the winners trophy following a decision by the BLDSA committee last Saturday morning. I would like to thank Stephen, and all on the committee who came to this decision, which I am told by Stephen has made BLDSA history! 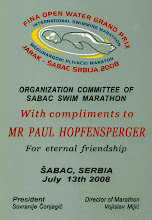 Apparently, in the 52 year history of the BLDSA, a "Veteran" (someone aged 45 or over) has never won a "Senior men's" race (a male who is over 16 years old). Thank you once again, and I promise to try not to do it again! 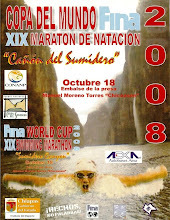 The next swim is a 15KM FINA World Cup Grand Prix in Mexico. Beccy and I have had our jabs and started our malaria tablets! Will probably take a trip to train in Dover Harbour on Saturday to get back in the open water before we leave for Mexico. Anyone fancy coming in for a dip with me, just e-mail me and we will meet you there. 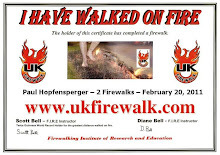 Well done at last Hoffie. BTW what was that patch on your lower back on the last posting? Forgotten waxing strip perchance? LOL! No it wasn't my forgotten waxing strip! It was my race card. We had a card for every race with our name, event number, heat number and lane number on. 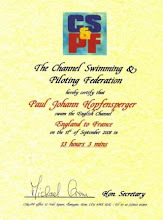 We had to hand it to the officials at the end of the lane before the race and they verify who we are. I tucked it in my trunks so that I could stretch before the race. 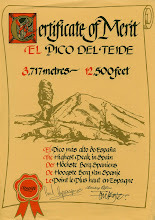 It's all very technical you know! LOL! I thought it was a name tag, but no-one else on EARTH surely possess such a wonderous pair of swimming leggings? !